Just five days before the EUI’s Spitzenkandidaten debate on the evening of the second day of The State of the Union 2019 (Friday 3 May), Thoughts for Europe will host, at the EUI, the live broadcasting of the debate between the lead candidates for Commission President that will take place in Maastricht on Monday 29 April. The broadcast will be directly followed by a discussion led by Thoughts for Europe, focusing on the outcomes of the debate. The main conclusions of the discussion will feed into the preparation of the EUI’s Spitzenkandidaten debate that will follow-up at the occasion of the State of the Union. By creating a bridge between the two events, Thoughts for Europe aims to contribute actively to the European electoral campaign. On 29 April, official candidates for president of the European Commission will debate in Maastricht. The Maastricht Debate will be live-broadcasted across the European Union. The 90-minute event will feature the front-runners to replace Jean-Claude Juncker as President of the European Commission. The Maastricht Debate 2019 is jointly organised by the three partners of Maastricht, Working on Europe – Maastricht University, the City of Maastricht and the Province of Limburg – as well as the European Youth Forum and the European Journalism Centre. This debate is particularly focused on the concerns of students and young people across Europe, many of whom will be voting for the first time. 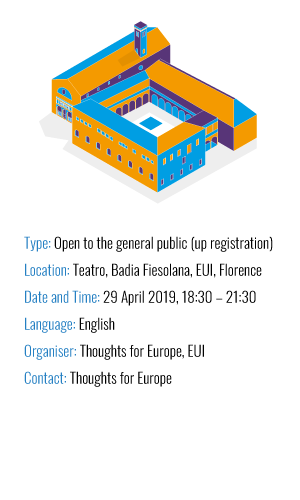 Thoughts for Europe is an EUI researchers-led initiative which aims at creating an informal space for debating the future of Europe, and in which different views can be represented and confronted. We intend to promote policy-oriented discussions that take can bridge the gap between academia and the political reality and think of the EU in pragmatic terms. 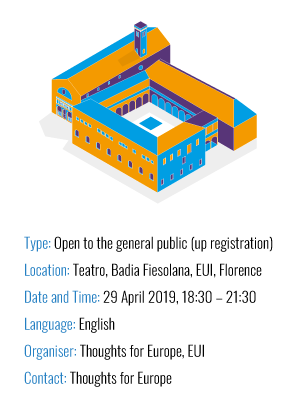 In addition to debates among the EUI researcher community on specific European policy issues, Thoughts for Europe organises debates with candidates to the European elections from February to May 2019 in the context of the 2019 European Parliamentary elections, with its MEP Debate series. Thoughts for Europe is also organising The State of the Union 2019 panel Generation(s) of the crises: How to address intergenerational inequalities in the EU?, which will be focused on intergenerational inequalities.